If you are using a special callsign (example IW1QLH/P or IW1QLH/IM or 3A/IW1QLH/P) you have to say it to your logbook program. 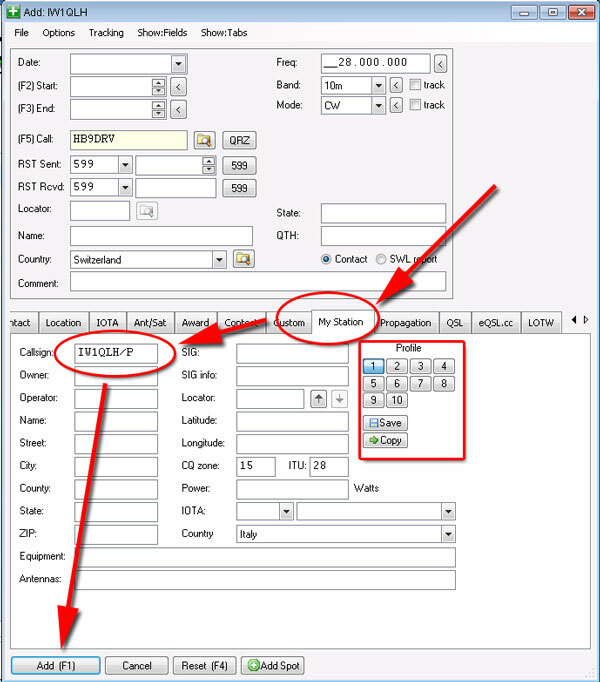 When you are adding a new QSO open the tab "My Station"
Type your special callsign in the field "Callsign"
If you use this profile many times then you can save it using the panel "Profile"
If you are importing your logbook from a different program using a ADIF file, bear in mind that HRDLOG.net use the ADIF field "station_callsign" if present. By doing so the QSO will be sent to HRDLOG.net and will be stored inside your logbook. In the other way, if you are using a special callsign (example dxpedition, contest team, etc) you can create a new logbook in HRDLOG.net (Login -> Utilities -> New Callsign).